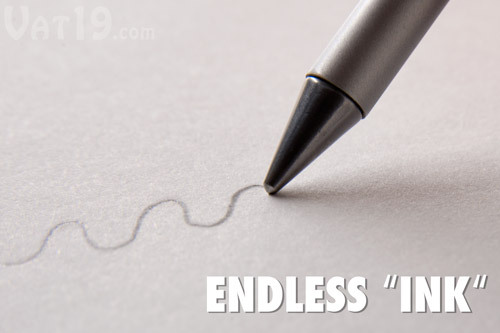 The Inkless Metal Pen Will Last Virtually Forever | OhGizmo! This will be the second time in less than a week that I’ve written about a writing utensil. Perhaps it’s just because I’ve been in a more artistic mood lately, though it could be a coincidence. When we think about the substances used for writing, it’s usually either graphite or ink. Last week we showed you a new pencil that uses something that is a hybrid of the two. Today I’ve found a pencil that uses lead. You might think that a pencil using lead isn’t a radical concept, as we use lead in them all the time. However, pencils have always contained graphite, not lead. It was actually a misconception back in the 1500’s when a large deposit of graphite was discovered in England. It was mistakenly thought to be a form of lead, and thus labeled as such. The name stuck, and despite being factually inaccurate, we still refer to the graphite in pencils as lead. So why the history lesson? Because this Inkless Metal Pen actually does use lead for writing. The tip is made from solid lead, which deposits tiny bits of the metal onto your paper. The amount used is so insignificant that the company claims that it will never dull, or need to be refilled. The benefits (aside from the ones just mentioned) include not smudging, not leaking, and the ability to be used in zero gravity. It is also completely permanent, so no erasing here. The Inkless Metal Pen will set you back $28, but should be well worth the money, as it won’t need replaced for a very long time. I never heard of anyone getting graphite poisoning, if you know what I mean. Great. A new way for kids to get lead poisoning. Does no one remember all the stories of kids eating old paint chips. Neat, now if they was only a way to keep someone from walking off with my $30 pencil…. This is a rather expensive way to slowly poison artists and children alike.